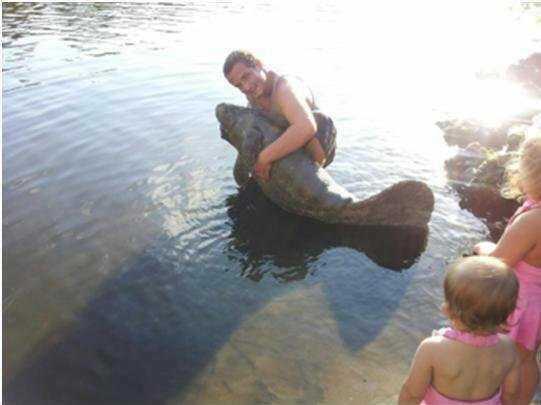 A man was arrested after posting photos on Facebook that showed him picking up a manatee. The incriminating images show Ryan William Waterman, 21, and his two children petting a manatee calf at Taylor Creek in Fort Pierce last month, according to the Florida Fish and Wildlife Conservation Commission (FWC). In one shot, Waterman is holding the calf partially out of the shallow water, and in another image, one of his young children is sitting on top of the animal as if riding it.While the family’s actions might look playful, biologists said such contact could be deadly for a manatee calf. Waterman faces charges under the Florida Manatee Sanctuary Act, which makes it illegal to molest, harass or disturb manatees, classified as an endangered species in the state. His offence also violates the Marine Mammal Protection Act of 1972, which makes it illegal to hunt or get up close to manatees as well as all other marine mammals, such as whales, seals and walruses. In December, a woman snapped pictures at Pompano Beach, on Florida’s Atlantic coast, of swimmers who might have been trying to ride a sickly sperm whale. The 35-foot (10.6-meter)-long creature was reported to be flapping its tail at the time of the incident and eventually washed ashore dead. And last October, a woman turned herself in after photos surfaced showing her riding a manatee at Florida’s Fort DeSoto Park near Tampa. At the time, reports suggested she could have faced up to 60 days in jail and a possible fine of $500 for her crime. There are estimated to be just 3,800 manatees in Florida, and each year, about 87 are killed by humans, according to the U.S. Fish and Wildlife Service, most of them dying in boat collisions. Coastal development, which has altered and destroyed manatee habitat, also threatens the species.